Random thoughts on Photography, Rails and .NET among other things. So yesterday after reading John Lam's blog (http://www.iunknown.com/2007/07/a-first-look-at.html) post about IronRuby I thought I would give it a try. I downloaded the source and built the project using visual studio 2005. 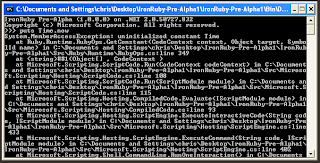 Next I opened up Scott Guthrie's blog (http://weblogs.asp.net/scottgu/archive/2007/07/23/first-look-at-ironruby.aspx) and was looking at his example of using IronRuby with WPF. I soon had 'hello world' put out on the console and in a dialog box. After getting 'hello world' out there I wanted to start playing. First I wanted to display the current time out to the screen so I tried out the ruby command Time.now, no dice. I got a message saying "uninitialized constant Time", I thought Time.now was automatically initialized by system. The next thing I tried that didn't work was using instance variables. I tried to use the statement: @msg = 'Hello World' and soon my console was filled with error messages. I was however able to use this statement: msg = 'Hello World'. I don't know if they plan on letting you use instance variables in IronRuby or not. So over all I was not greatly impressed with IronRuby but am still excited for new versions to come. I guess 'Rome wasn't built in a day' and the progress the IronRuby team has made is in the right direction. Again I only played with this for 10 minuets thus am not an expert. So go out try it and let me know what you think. I am currently a Rails Ninja and wanna be rock star. I enjoy programming, playing with technology, photography, and hockey. I have a wonderful fiancée that I love to spend time with.